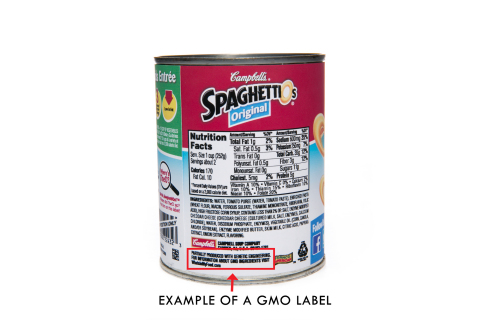 In the case of mandatory labeling of foods containing Genetically-Modified Ingredients, at least one corporation, Campbell Soup Company, has seen the ‘writing on the wall’ about the inevitability of marking products to denote whether or not GMO ingredients are included. And it has now asked for a single universal standard across the entire United States for how food products that include GMOs must be labeled. The company released a graphic giving one example of such a label below. In a press release recommending the labeling, Campbell Soup Company said it “continues to recognize that GMOs are safe, as the science indicates that foods derived from crops grown using genetically modified seeds are not nutritionally different from other foods”. But with the pressure on from consumers, activist groups, increased information suggesting links between GMO crops plus their pesticides and cancer, and the leadership by regional political officials at all levels, many food companies – like Campbell’s – are realizing they will end up having to mark their products that include Genetically-Modified Organisms (GMOs) as having those kinds of ingredients. And having seen this sea change appearing, Campbell’s is recommending there be just one label rather than the potential of many different labeling requirements by city, county, state or at the Federal level. So, on January 7th, Campbell Soup Company announced its support for the enactment of federal legislation to establish a single mandatory labeling standard for foods derived from genetically modified organisms (GMOs). “The company continues to oppose a patchwork of state-by-state labeling laws, which it believes are incomplete, impractical and create unnecessary confusion for consumers. “Campbell is optimistic a federal solution can be established in a reasonable amount of time if all the interested stakeholders cooperate. However, if that is not the case, Campbell is prepared to label all of its U.S. products for the presence of ingredients that were derived from GMOs, not just those required by pending legislation in Vermont. The company would seek guidance from the FDA and approval by USDA. For those completely opposed to the growing and sale of GMOs, this step definitely does not end the battle. But with a company of the size and stature of Campbell Soup Company agreeing to lay down some of its legal arms and agree to GMO content labeling in this way, it is a big step forward.